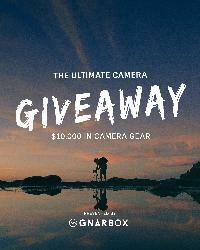 This contest has been marked as a duplicate of Win the Ultimate Camera Giveaway from Gnarbox including a FUJIFILM X-H1 worth $1700 and More! . What you must do to enter: Enter via Gleam (All winners agree to pay shipping)International winners (including EU regions) will be responsible for VAT, duties or import fees on the shipment of their prize. Statistics: This contest was opened by 17 and entered by 5 ContestChest.com members. 29% of those who opened the contest, entered it.